On a night when Deens appeared to dominate both on and off stage, the hallowed QPAC Convert Hall rocked to the hip hop sounds of Native Deen, an all American trio group who performed their brand of nasheeds with the aid of drums, synthesized percussion instruments and a vitality that harked back to the days of the Four Tops and the Temptations. Earlier in the evening South Africa's Zain Bhikha brought a touch of nostalgia to expatriates with a stirring rendition of the South African national anthem Nkosi Sikelel' iAfrika, and for Yusuf Islam fans delivered a more than competent tribute to the man with Peace Train. Abu Ratib added a Middle Eastern segment to the evening's proceedings and Nazeem Hussein a touch of raw home grown Muslim humour that the 800-strong Brisbane audience lapped up with gusto. The Sounds of Light is a slick and polished fund raising event put together by Human Appeal International in aid of the orphans of the world. The Brisbane-based Hope for Happiness community group helped bring the Sounds of Light to Brisbane for the first time and, despite having just four weeks to put together and promote the show here, did an excellent job of it in the end even down to ensuring that QPAC made provisions for Halal foods. Well done HFH! 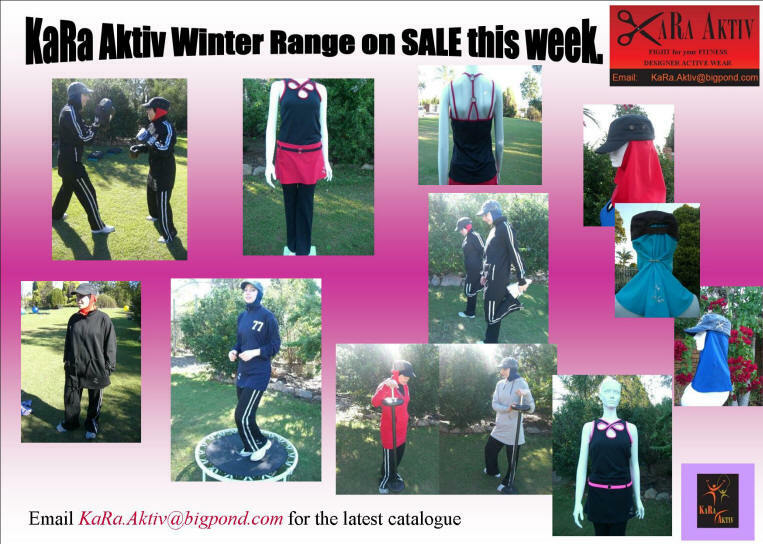 We are looking forward to the next promotion. 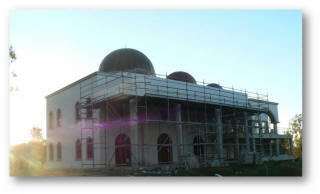 The outdoor building of the mosque is 90% completed. Four domes have been put in place. The main dome, at a cost of $150,000, was made by a company from Sydney (Architectural Roofing & Wall Cladding - the company which made the dome at the Marriott Hotel in Brisbane). 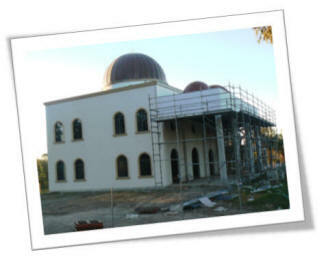 Progress inside the Mosque has slowed down because of a shortage in funds with about a third completed. For this final part of the exercise, funds are needed as soon as possible to see it to completion. "We thank everyone who has participated in the building of the mosque by giving donations," Imam Sifet Omerovic told CCN. There are also opportunities to donate specific items to the Mosque such as light fittings, security systems, tiles, furniture, sound system, plumbing items etc. Please email Imam Omerovic at sifet@optusnet.com.au for a more detailed list if you think you might be able to help out. 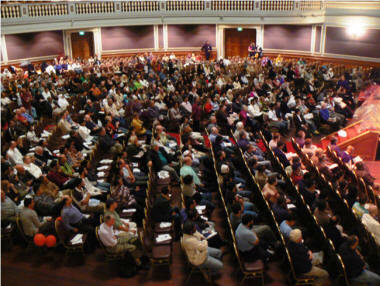 Around 800 people attended the "Islam Exposed" lecture at the Brisbane City Hall last Sunday. It was a well-organized and coordinated affair on the part of the Discover Islam Team and the ring of volunteers who circled the Hall. The presentation lasted close on two hours. THE Australian Defence Force is poised to engage Muslim leaders for the first time to help manage its chaplaincy services and care for the mental health of its troops. An internal review of chaplaincy services has recommended greater involvement of non-Christian faiths to reinforce the doctrine of freedom of religious practice. While a majority of ADF members - 57 per cent in total - identify themselves as being Christian, Defence does not force members to declare their religious faith or specify whether they are practising or non-practising. However, a Defence spokesman has confirmed more than 300 members have voluntarily reported non-Christian faiths that need to be better catered for: 142 Buddhists, 79 Hindus, 67 Muslims and 17 Sikhs. "Defence accepts the significance of religious faith in people's lives and upholds the freedom of religious practice," the spokesman said. "Therefore, ADF members are encouraged http://www.theaustralian.news.com.au/story/0,25197,23904946-31477,00.htmlto practise their religious beliefs according to freedom of choice. This is met to a significant extent by the provision of permanent and reserve uniformed chaplains, and is supported by access to local civilian resources, as available, to meet the requirements of different faith groups." In December 2004, a new relationship was struck between the Chief of the Defence Force and Heads of Churches Representatives which resulted in a change to the Religious Advisory Committee to the Services (RACS) and the creation of an Affiliated Representatives Committee (ARC). The review has now recommended Buddhist, Hindi and Muslim representatives be appointed to the ARC. "There has, however, been difficulty in identifying agreed representatives of these faiths," the spokesman said. CAIRNS: DUNN St residents are gutted and angry after an appeal to stop a mosque being built in their street was thrown out of court. The proposed mosque had been the target of intensive opposition from residents and from an anti-Islamic website that was investigated by Australian Federal Police after it called on supporters nationwide to oppose the mosque. The website had been linked to a Cairns businessman who dubbed himself "Sheik YerMami" and called on supporters to "do whatever it takes" to oppose Islam and the, building of the mosque. Judge Keith Dodds yesterday dismissed the residents' appeal in the Planning and Environment Court against the mosque being built in the quiet North Cairns street. "We've all been let down and are terribly disillusioned," resident Bill Bradley said. "We are not happy but that's the way it goes." Mr Bradley was among a group of 12 residents who appealed against the former Cairns City Council's approval to demolish a house and build the purpose-built mosque opposite the Pioneer Cemetery and Kuranda rail line between low-set Queenslander- style houses. At least one of the residents who appealed against the mosque's approval has already put his property on the market, with others considering a similar move. Fellow residents Michael and Kathy Gelling said they were `..'disappointed" with the outcome, arguing the mosque would ruin the quaint streetscape. Judge Dodds said the house, which was built in the 1950s and would be demolished, was not "an important part of the streetscape of Dunn St" and "to demolish it and replace it with a building which complements the character values of the character precinct will not diminish the precinct". 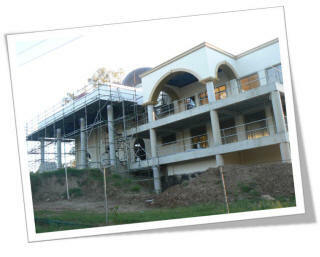 Recommendations for the construction of the prayer hall and kitchen facilities included fake windows and mature landscaping. "There should be at least three of these hooded windows on each side of the prayer hall," the report said. Mr Bradley said he feared the conditions would not be met, given conditions set in 2000 when the zoning of the land was changed to a church such as landscaping were never completed. Far Northern Islamic leader Imam Abdul Aziz said he was pleased the case had finally been settled, after first being submitted to council early last year. "We are very happy because basically we ended up with what we had before it went to court," Mr Aziz said. "What every one has to realise is that everything we have planned is in accordance with the town plan." The Islamic Council of Queensland held its annual Quran Reading Competition last Sunday at the Islamic College of Brisbane where some 60 youngsters representing a number of local Schools and Madrasahs took part. Certificates of achievement were given to all the participants and the 1st, 2nd and 3rd placed winners in each of the eight age and gender categories were presented with trophies by the Guest-of-Honour for the occasion, Haji Dawood Khatree. The institutions which took part included the Islamic College of Brisbane; the Islamic Societies of Algester, Holland Park, Gold Coast and Toowoomba; and the Capalaba, Kuraby, As-Salaam, Eagleby Kotku and Iqra Rodha-tul-Aftaal Madrasahs. Zaahid Hurst (left) and Rasheed Romero (right) of the Islamic Society of Gold Coast and step sons of Mr. Hamid Goran (centre) won 3rd and 2nd places in their respective categories. Both boys converted to Islam three years ago with their mother Ms. Khadijah Hurst. Ms Hurst is the Secretary of the Faith And Cultural Exchange which has been active in raising funds for an Education Project in Chad (see CCN0187 for a report on the work being undertaken). Mr. Goran, who hails from Chad, arrived from Saudi Arabia three years ago where he taught Quran reading. 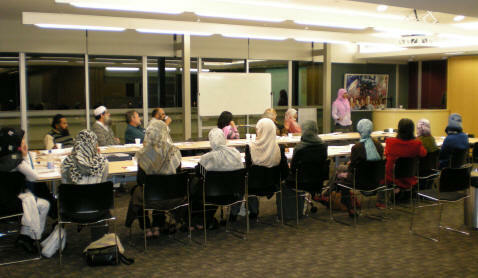 Last week 21 community leaders, including Imams, attended an information session on the research being conducted on intimate partner violence (also known as domestic violence) in the Australian Muslim community by PhD student, Ms. Nada Ibrahim, from the Griffith Islamic Research Unit, Griffith University. There were presentations by Prof Paul Mazerolle, Dr Mohamad Abdalla and Ms. Nada Ibrahim. Prof Paul Mazerolle, the Director of the Key Centre for Ethics, Law, Justice and Governance, gave an overview of violence between partners in the Australian context and the various researches currently being undertaken by the Centre in this area. Dr Mohamad Abdalla, Director of Griffith Islamic Research Unit, spoke about the lack of research on intimate partner violence (IPV) in the Muslim community, the importance of doing research on domestic violence in the Australian Muslim community and how Islam views domestic violence from the Quranic and hadith perspective. Nada Ibrahim spoke about the technicalities of her current research and how it was going to address some aspects of IPV in the South East Queensland Muslim community. It is anticipated that the findings of the research will identify preventative measures in addressing violence between partners and impact on social policies on IPV that are both culture- and religion- specific. The questions raised by the community leaders included issues about defining IPV, percentage and whereabouts of population that was going to be sampled, the theories underpinning the research, how were the Imams and Muslim population going to be accessed for the research, the importance of having information seminars to make Muslims aware of the issues related to domestic violence, the importance of using art in intervention towards IPV, how this research is a step towards prognosis of the problem of IPV before treatment of IPV can take place, and what plan was in place if some of the women or men interviewed in the interview phase of the research were using the interview as a “cry for help”. During the Q & A session, it was important to reiterate that domestic violence was a human problem and not a problem particular to Muslims. It was also important to clarify the research limitations in time, resources and funding, and how it was one small step towards uncovering the extent of IPV within the Muslim community so that something can be done to address it. The next phase of the research, the initial consultations with Imams and Muslim community leaders will be conducted towards the end of July 2008, followed by a survey that will be posted out to members of the South East Queensland Muslim community in September/October. For more information about the research you may contact Nada Ibrahim on (07) 3735 6992 or email n.ibrahim@griffith.edu.au. Debate raged across the nation during the week about whether a pluralistic and free society could happily accommodate the practice of polygamous marriage. Keysar Trad, president of the Islamic Friendship Association, spoke out this week, admitting he had once considered marrying another woman. He also backed calls by another senior member of the Islamic community, Sheik Khalil Chami of the Islamic Welfare Centre, for polygamous relationships to be recognised. Sheik Chami said polygamous marriages, although illegal, existed in Australia and he had been asked almost weekly to conduct polygamous religious ceremonies. Although he refused, other imams did not. Multicultural advocacy campaigner Yassmin Abdel-Magied was the overall winner of the community category of the Quest Young Achievers' Awards last week. Yassmin, of Sunnybank Hills, won the community involvement award for setting up a youth-run advocacy group Youth Without Borders to help draw services together and was selected from almost 1300 young people to attend the 2020 Youth Summit in Canberra. "In Focus" is a Lakemba, Sydney-based radio discussion show on Voice of Islam 87.6FM addressing general social issues and issues in particular to the Muslim community. It includes special weekly topics and interviews with prominent members of the Australian community. The program is broadcast live in English on Tuesday nights between 7-8 pm and repeated on Saturday mornings. TV veteran George Negus has proved he's got a touch of the Ali G, turning his hand to a mock interview with Uncle Sam from SBS comedy panel series Salam Cafe. Salam Cafe is comedy panel series recorded in Melbourne and Sydney which features young Aussie Muslims discussing the humorous side of current issues, with sketches from award-winning comedians (including Nazeem Hussain who plays Uncle Sam). In this sketch, Negus is talking to Uncle Sam about his campaign to run for Mayor of Camden. This suburb has been the subject of much press attention recently, after its residents expressed their desire to prevent a Muslim school being built there. Exploiting the Muslim- Jewish divide is the wrong way to win votes. Multicultural community organisation requires a Project worker (male) who identifies with the Muslim faith. Multi-region project based at Logan, aims to support unemployed and underemployed Muslim people who are disadvantaged in the workplace. Thank you so much for including me in your e-news letter. I look forward to keeping up with your news. Shaykh al-Islam Taqi ud-Din Abu'l-Abbas Ahmad Ibn al-Halim ibn Abd al-Salam Ibn Taymiyah al-Hanbali was born in , 661 AH (1263 AC) in Haran, which is now in Eastern Turkey, near the border of northern Iraq..
His family had long been renowned for its learning , among his teachers, was Shams ud-Din Al-Maqdisi, first Hanbali Chief Justice of Syria following the reform of the judiciary by Baibars. The number of Ibn Taimiyah's teachers exceeds two hundred. Ibn Taimiyah was barely seventeen, when Qadi Al-Maqdisi authorized him to issue Fatwa (legal verdict). Qadi remembered with pride that it was he who had first permitted an intelligent and learned man like Ibn Taimiyah to give Fatwa. At the same age, he started delivering lectures. When he was thirty, he was offered the office of Chief Justice, but refused, as he could not persuade himself to follow the limitations imposed by the authorities. Australia is now the world's fattest nation! The most definitive picture of the national obesity crisis to date has found that Australians now outweigh Americans and face a future "fat bomb" that could cause 123,000 premature deaths over the next two decades. The latest figures show 4 million Australians — or 26% of the adult population — are now obese compared to an estimated 25% of Americans. A further 5 million Australians are considered overweight. [Editor] Asked to explain his own very generous contributions to the Australian 'fat stats' our Man-on-the-Mussallaah replied that he was merely doing his bit to fully integrate into Australian society. After all, as things stand, he was more likely to draw attention to himself as a slim and trim citizen than he would have with a beard, white cap and long robes. Combine flour, yeast, salt and sugar in a mixing bowl. Mix water and egg together until well combined. Add enough liquid to flour and mix to soft dough. Knead in the melted butter until dough is smooth. Cover and leave to rise until doubled in size. Punch down dough, knead for 1 minute and divide into 24 balls. Working on a floured surface, roll each ball into a long stretched oval shape. 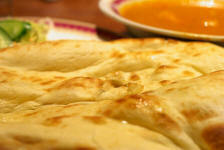 Heat a non-stick frying pan and place naan in. Cook on one side until bubbles begin to appear. Turn Naan over onto a baking sheet and place under a griller until other side puffs up and blisters form. Brush with melted butter and serve hot. 'Oh, I understand,' said Jalaauddin. 'No' said the Director, 'A smart person would pull the plug.